St. Brigid’s Day, February 1, marks the start of Celtic spring. Imbolc, also known as the Feast of Brigid, on February 1, celebrates the arrival of longer, warmer days and the early signs of spring.It is one of the four major “fire” festivals (quarter days), referred to in Irish mythology from medieval Irish texts. The other three festivals on the old Irish calendar are Beltane, Lughnasadh, and Samhain. In ancient Irish mythology Brigid was a fire goddess. Nowadays her canonization is celebrated with a perpetual flame at her shrine in Kildare. St. Brigid represents the Irish aspect of divine femininity in her role as patron saint. Just as we vacuum and sweep to clean walls and floors, we can also perform periodic sweeps to clear away negative energy. We can use essential oils, incense, candles and sage smudges for clearing away unwanted energy. 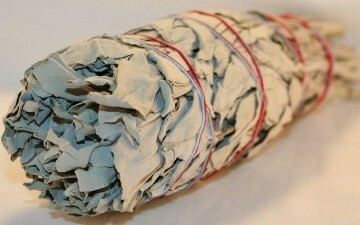 Burning White Sage raises the vibration of dense energies, dissolves negativity, drives out disturbances and protects our sacred space. Clear each room in the building or space, one at a time. Starting from the center of the room, use a feather or our cupped hands to move smoke outward towards the outer edges of the room. Make a spiral pattern with the smoke and affirm your intent, “this space is pure and free from negativities. It is safe from all harm.” Fill the room with smoke and visualize negative energy moving out of the space as if being sucked by a vacuum. When one room is done, close the door and move on to the next room. When all rooms have been treated, give thanks to the guides and spirits that assisted in the clearing , wait several minutes and, starting with the first room, open the doors and windows to allow the loosened negative energy to dissipate and leave the space.